The Paceman concept has Mini's familiar front end and a "coupe tail" to give it an athletic appearance. 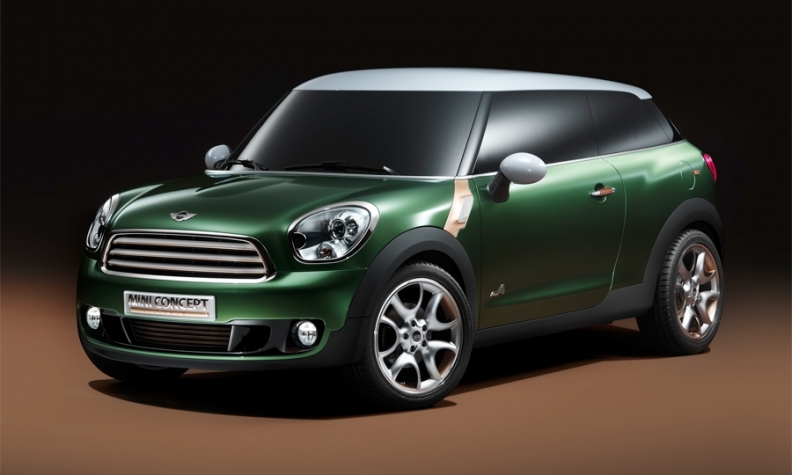 Mini will introduce a two-door concept crossover called the Paceman at the Detroit auto show next month. The Paceman uses the same platform and has the same dimensions as the Countryman crossover, Mini's first four-door that goes on sale early next year. The concept also has a larger tailgate than the Countryman. Mini said in a release the car has not been approved for production but "Paceman could form yet another building block in the development of the Mini brand." The concept has a familiar Mini front end with large headlights surrounded by chrome and the same radiator grill as the Cooper S Countryman crossover. But it has what Mini calls a "coupe tail" to give it an athletic appearance. "In contrast to the more vertical design of the Mini Countryman, we've given the Mini Paceman concept a horizontal emphasis and accentuated the width of the car more to underline the powerful appearance of the study," Marcus Syring, head of Mini exterior design, said in a statement. Under the hood, the Paceman has Mini's performance-oriented John Cooper Works 1.-6-liter turbocharged four-cylinder engine with 211 horsepower.